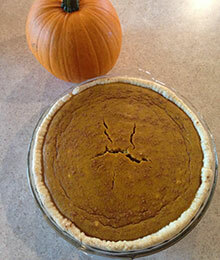 Cut fresh pie pumpkin in half, remove seeds (can roast the seeds, save them to plant next year or give them to the deer and squirrels) and place cut down side in a baking dish large enough for both halves. Add about 1/2 cup water. Roast in 350 degree oven for about one hour or until very tender. Let cool and scoop out pulp. Place in food processor and puree until smooth. I usually add about a tablespoon of real maple syrup. This should make about 3 to 3 and 1/2 cups of pumpkin. You can store this in a glass dish in the fridge or freezer. Combine flour and sea salt in food processor. Pulse once to mix. Add butter until it resembles coarse crumbs. Add 1 tablespoon of water and pulse, a few times. Add a second tablespoon of water and pulse until the dough forms a ball. This takes a few seconds. If your mixture is too dry, you can add another tablespoon of water, one teaspoon at a time. Turn the dough out onto a floured surface. Press the dough ball into a disk. Place disk in plastic bag or wrap securely with wax paper and place in fridge for 30 minutes. After 30 minutes remove disk from fridge and return to floured surface and cover with a sheet of wax paper so you don't have to add more flour. Roll to about 1/4" thickness. Be sure to flip and rotate your dough as you go so it does not stick to your surface. 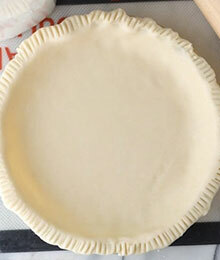 Roll out the dough to a few inches larger than your pie plate (about 12" for a 9" pie plate). Place in pie plate and press to fit. Tuck under any overhang and crimp or use the tines of a fork to decorate the edges. Chill. Add flour, butter, and salt to a large bowl. Cut your butter in using a pastry cutter. Work in one tablespoon of water at a time. I find I need to use 2-3 tablespoons of water when I'm doing this by hand. The rest of the steps are the same as above. You can double the recipe to make a double crust or what I usually do is wrap the second crust and freeze it for later. when you want to use it, simply let it thaw in the fridge before rolling it out. Mix well (I use a hand mixer) and pour into pie crust. If there is extra I pour it into a ramekin dish and bake for 45 minutes. Bake pie at 350 degrees for 55 minutes. Remove from oven when filling is just set. It will firm up after its cooled. Top with fresh whipped cream and a drizzle of maple syrup! !